I’ll start by explaining the odd title. A couple of times recently I’ve been out and looking for plants and noticed that several characteristic species of that habitat were growing close to each other, giving a typical snapshot of its ecology. Number one? Yes, there’s another one coming soon. 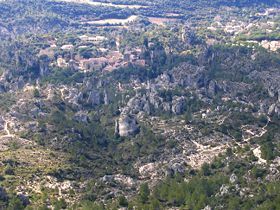 The first place is near the Cirque de Mourèze, an area of dolomitic pillars and weird shapes sculpted by erosion, about 20 km north of where I live. Dolomite – a mineral named after the French geologist Déodat Gratet de Dolomieu (1750–1801) – is formed by the combination of magnesium and limestone, and resists erosion so that patches of it protect the limestone beneath while the surrounding stone is eroded by acidic water. Just north of Mourèze the narrow road goes through a few hectares of a unique landscape known to Chaiselongue and me as ‘the Libyan bit’ or ‘the road to Apollonia’, not for a Hope/Crosby film but since it reminds her of a landscape she knew as a child in North Africa. 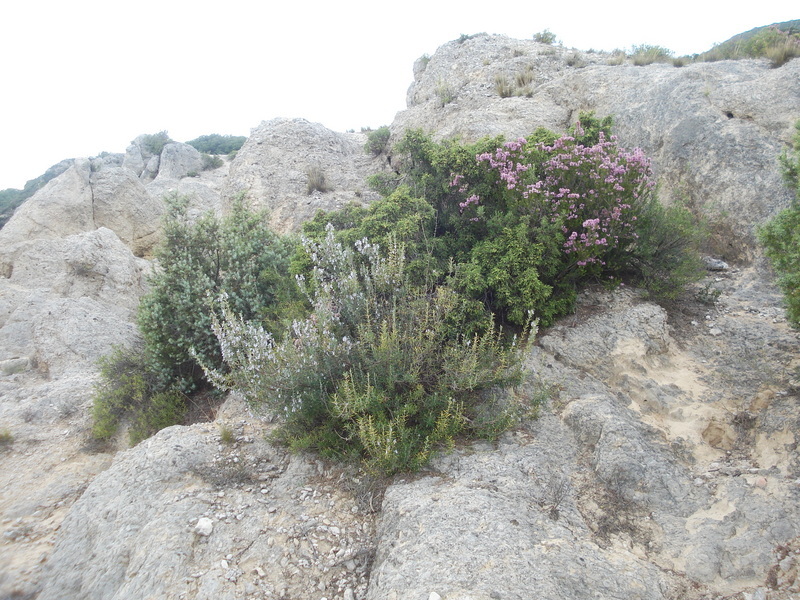 It’s a very dry sandy area between hills of limestone outcrops, protected in a small pass. It’s the only area I’ve seen near here which has a lot of heather growing in it, and in the patch I saw, that was associated with juniper and rosemary. All three plants have adopted the same dense bushy shrubby habit, and small linear leaves, for the same reason: to reduce water loss. All three are often found near the sea, adding to the coastal feel of ‘the Libyan bit’. Spot the odd one out? Yes, juniper is a conifer, so it has cones rather than flowers like the other two. The juniper is Juniperus oxycedrus, prickly juniper. 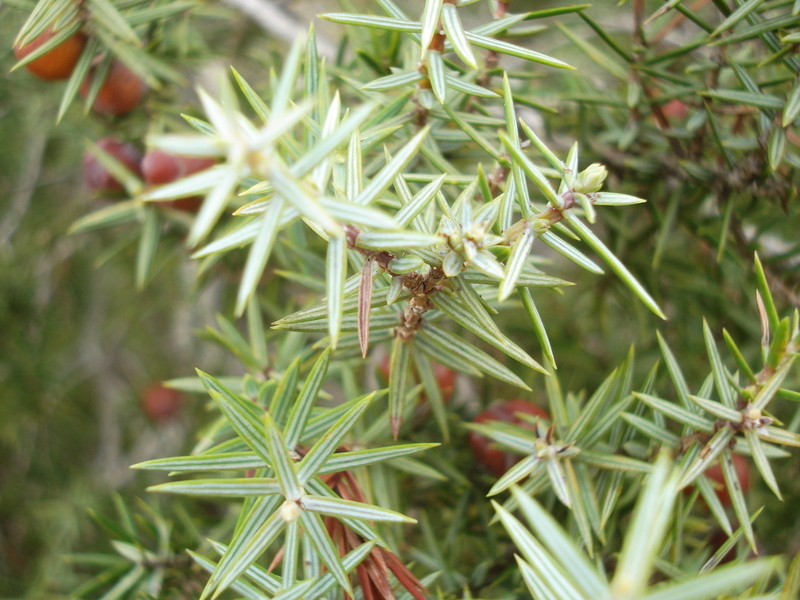 The leaves are typically arranged in threes on the stem, and this species is distinguished from the other common juniper species, J. communis (common juniper), by having two white stripes on the top of the spiky leaf, while J. communis has only one on a softer leaf. The former species is native to and most common in the area of the Mediterranean basin where it often colonises burnt or neglected ground; it also has brownish cones ripening to red-purple in the second year. The latter species is native to Britain and in my area tends to be found at higher altitudes; it has green cones ripening to black and it’s these which give an oil used for making gin. 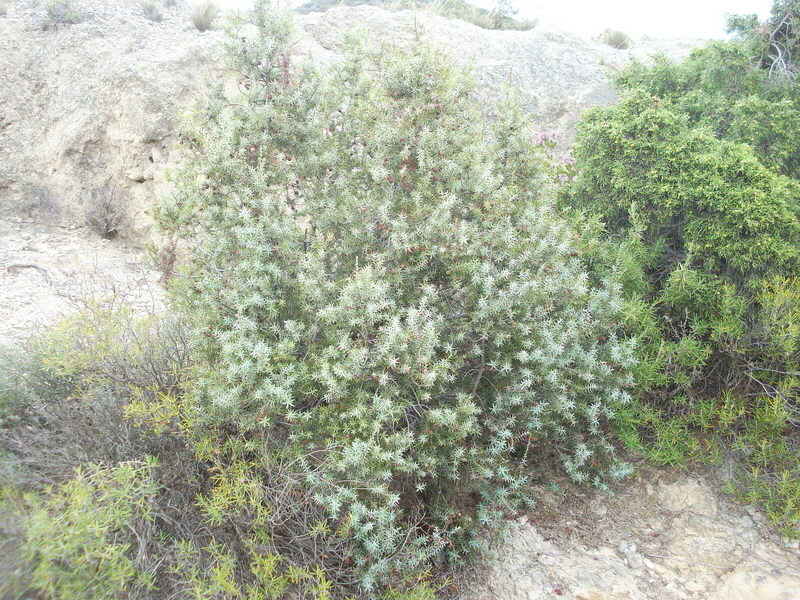 The wood of prickly juniper, known as cade in French, produces an oil which has disinfectant properties and is used in the treatment of psoriasis. The wood of both is valued for its durability – I have a lovely pocketknife with a juniper handle. 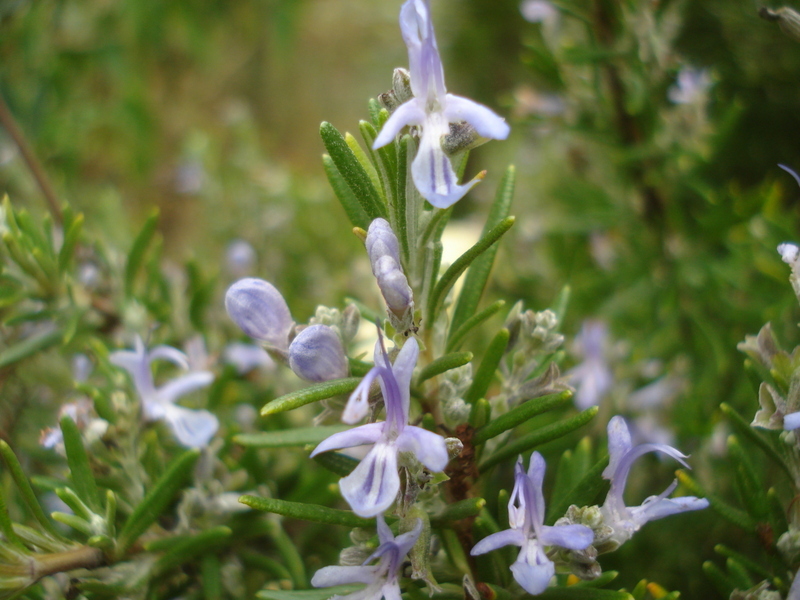 Then there’s rosemary (Rosmarinus officinalis), too well known to say a lot about except that its English name has nothing to do with roses or Mary, coming from the Latin ros marinus meaning ‘dew of the sea’. The Roman Pliny explained that it grew ‘in dewy places’ – well, maybe, but dew is rare where I found it. The two prongs rising from the flower are the two stamens. Glands on the leaves produce the oil which gives the plant its aroma, and which is supposed to improve blood circulation. I love using rosemary with all sorts of meat, and roast or fried potatoes (my son’s idea), though famously Elizabeth David wouldn’t have it in the kitchen except as decoration in a vase. 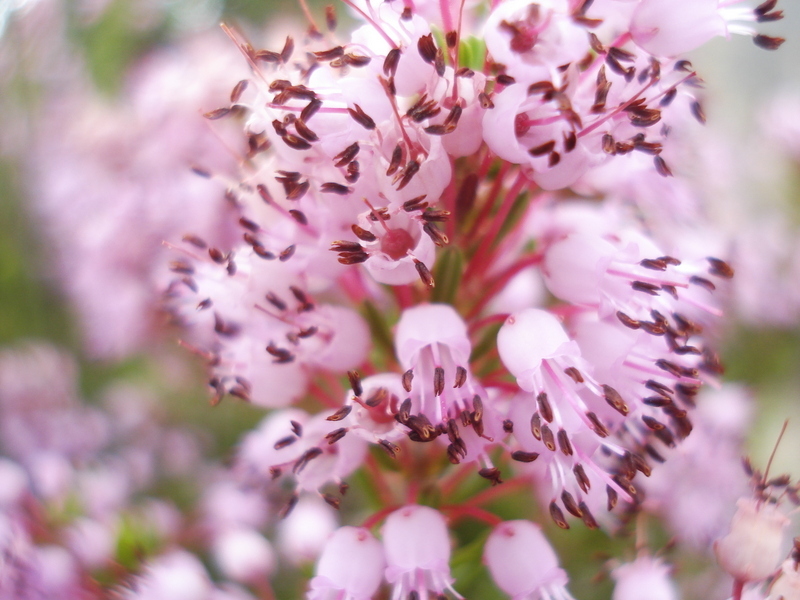 The heather is Erica multiflora, which I don’t think has an English name, probably since it’s native to the area between Spain, North Africa and Italy. The stamens protruding from the bell are a characteristic feature, as are the long stems, which bear the flowers near the tips. For this trio of plants I thought I’d find some trio music. If someone says ‘jazz trio’ what usually comes to mind is a piano/bass/drums unit, such as the famous Bill Evans or Brad Mehldau outfits. To mark the North African connection I’m suggesting something different which is a favourite of mine : the Anouar Brahem Trio with the Tunisians Brahem on oud and Lassad Hosni on percussion, and Barbaros Erköse (from Turkey) on clarinet. Here’s the title song from their album Astrakhan Café (2000). NB – if you like this, look on youtube and you can find the whole album – better still of course, buy any Brahem album and you won’t be disappointed. Coming up next: number two in the series.